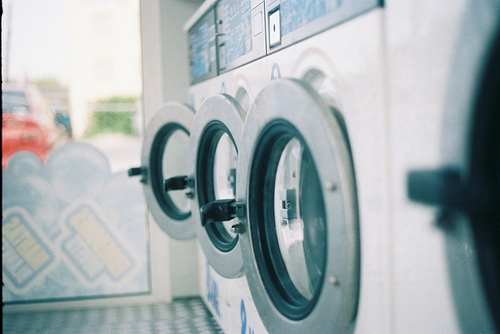 Laundry day can be the worst day of the week, or month (we won’t tell! ), and we could all use some tips to help get through this exhausting task. Here are a few of our favorite things to make laundry day more bearable. We all know sorting clothes into color categories can take up time, and that’s where these come in. Just throw one into the washing machine and you can wash your darks, whites and brights all at once! However, if you’re washing your clothes in a dorm laundry room, you can’t use them — they can break the washing machines and prevent them from draining water properly. You can find these gems at Target or Walmart. If you’ve ever gotten sick of the scent of your detergent, Downy Unstopables are for you! All you have to do is add some of these scent beads when you wash your clothes, and your clothes will come out smelling wonderful! As advertised, the scent really does last for a long time. The best part is that there are several scents, so there is something for everyone. If you’re tired of measuring capfuls of laundry detergent or fabric softener, try Method’s detergent and fabric softener! Each bottle has a pump so that you can easily adjust the amount of product you use without much hassle; they are also designed to help you get every last drop! These little miracles can be found at Target and come in multiple scents, so it’s easy to find a scent for everyone. Several brands, such as Tide, make laundry detergent “pods,” which contain a pre-measured amount of laundry detergent and sometimes fabric softener. All you have to do is throw the little pod in your washing machine and you’re good to go! Unfortunately, you cannot use these in dorm washing machines either. You can find these at most major retailers. When doing our laundry, we all need as many little tips and tricks as we can find. Doing laundry is never fun, but with these tools it will be much more bearable!